As oral health advocates, we can sometimes feel frustrated to see dental issues fly below the public’s radar screen. True, there is a lot about oral health that Americans don’t know, but the good news is that the interest is there. 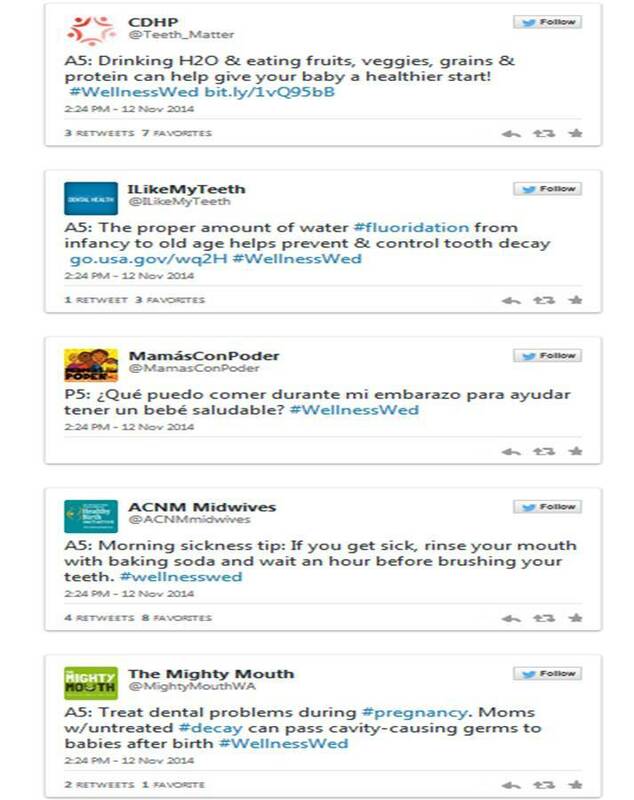 The proof comes from last week’s Twitter chat about the oral health of pregnant women and infants — an event that drew a wide range of partners and generated nearly 11 million Twitter impressions. On Wednesday, November 12, the Children’s Dental Health Project (CDHP) joined numerous other dental, maternal and child health organizations in a #WellnessWed Twitter chat hosted by MomsRising. The oral health of pregnant women has been a crucial element of our work over the past few years; and with prevention being one of our top priorities, it’s only right that we focus on where life begins — the mother. This summer, we launched our electronic ‘one-stop shop’ Oral Health & Pregnant Women Resource Center which shares key information, recommendations, guidelines, tips and more for parents and health professionals. But there’s always more to be done, and always more people to reach. Although our work is generally targeted to policymakers, advocates, and state oral health programs and coalitions, we recognize the need to reach the families for whom we’ve been advocating. Research shows that four out of 10 pregnant women have some form of tooth decay or gum disease, and a lot of women don’t know that visiting a dentist during pregnancy is safe. We saw this Twitter chat as a huge opportunity to educate mothers and the organizations that educate and advocate for them. Through its weekly #WellnessWed chats, MomsRising raises awareness about a variety of important health issues. CDHP was thrilled when the organization responded favorably to our idea for doing a chat about the oral health of pregnant women, moms and their babies. We were pleased that many key stakeholders added their expertise to the conversation as well. These organizations included the American Academy of Pediatrics, American College of Nurse-Midwives, The Children’s Partnership, state oral health coalitions in Virginia and Pennsylvania, Healthy Mom & Baby (magazine). The Latina version of MomsRising (MamásConPoder) also participated, which helped ensure that our oral health messages reached thousands of Hispanic women. Social media is a powerful tool to reach people who are interested in learning more about oral health. Either we’re working with what’s working, or we’re not working at all. See you on the web waves! Follow us @Teeth_Matter & Friend us on Facebook.